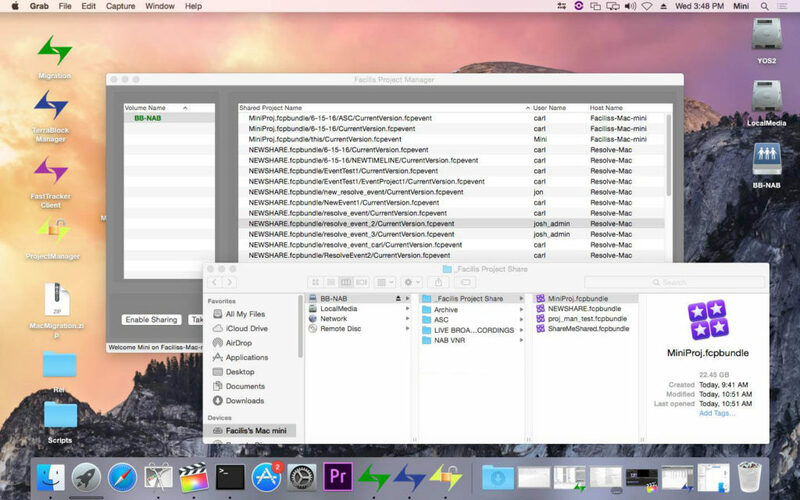 Final Cut Pro X is an easy to use editorial software that is being adopted by many editors for it's speed, format compatibility and accessibility. Facilis Technology has many FCPX facilities running on the latest version of TerraBlock systems, and FCPX is among the applications qualified on each release in the Facilis labs. Beyond simple edit-in-place media sharing, Facilis offers native Library support and sharing on any TerraBlock Multi-user Write volume. When enabled through the Facilis Project Manager, evens are safe from overwrite and corruption. This resolves the issues inherent in FCPX library structure that keeps many FCPX workgroups from storing Libraries in a shared location. It is recommended that all TerraBlock Virtual Volumes be created as Multi-User Write for optimal performance and compatibility. Copy the clips from incoming media to the Facilis volumes, and when importing the media to an event, simply chose to leave the files in place. Libraries can then be held in a local location, or on a dedicated Facilis Multi-user Write volume. If sharing the Facilis volume, use the Library Sharing workflow below. Libraries store the compositional metadata for the editorial process, and can also store actual media files if the option to copy files is selected during import. Libraries, and the projects and events contained within can be saved on any Facilis Multi-user Write volume, when connected over Ethernet or Fibre Channel. 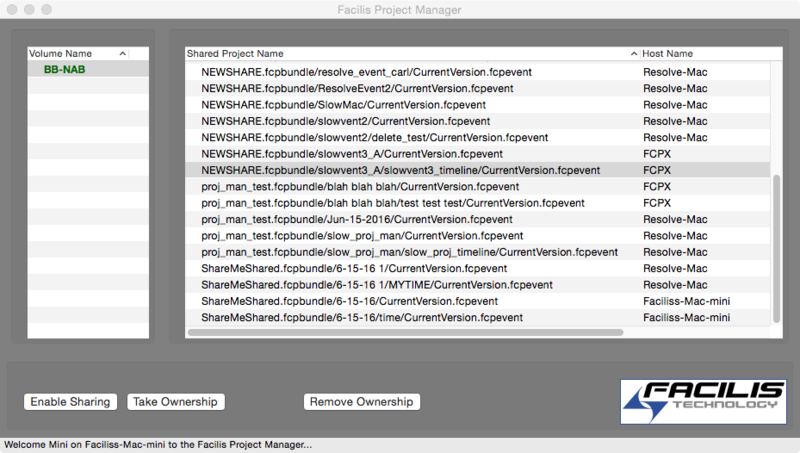 To enable a volume for Library sharing, use the Facilis Project Manager. A managed directory called "_Facilis Project Share" will be created on enabled volumes. Any Library saved into the managed directory is sharable, and any event created will be locked to the creator workstation. When the Library is saved to the _Facilis Project Share directory, this functionality is enabled. 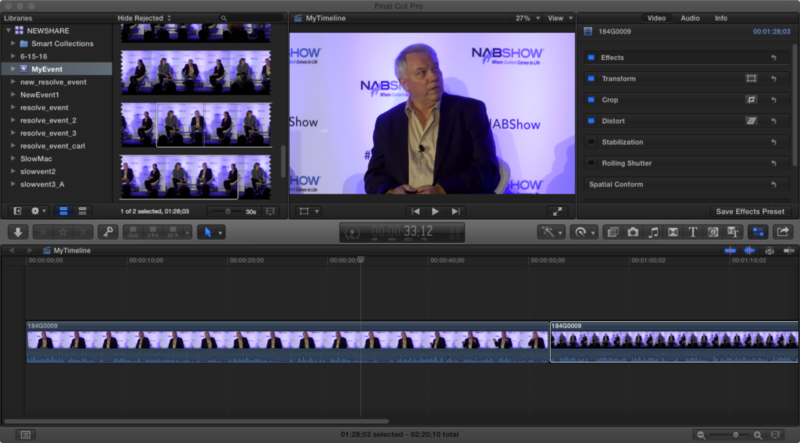 In FCPX, the events that are locked to the current user are accessible, and the user is able to add data to the event. If the event is locked to another user, that event is not accessible. In the example below, all events are locked except for MyEvent, which is available to the current user. In the Facilis Project Manager, a user is able to take ownership of an event within a library, even if that library is open on another workstation. Then when opening the library, that event will now be accessible to the local user.